From January to August 2014, the investment in fixed assets (excluding rural households) reached 30,578.6 billion yuan, up by 16.5 percent year-on-year in nominal terms, dropped 0.5 percentage points over that in the first seven months. 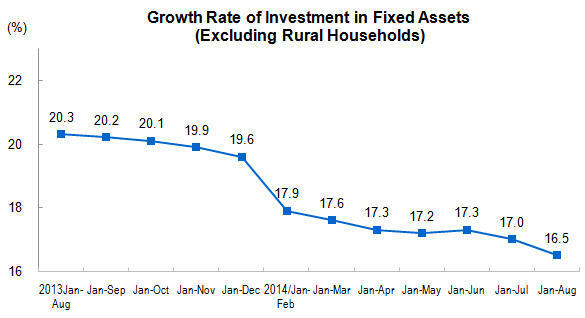 In August, the investment in fixed assets (excluding rural households) increased 1.23 percent, month-on-month. In term of different industries, from January to August, the investment in primary industry was 730.8 billion yuan, went up by 26.3 percent year-on-year, increased 1.2 percentage points over the first seven months; that of secondary industry was 12,875.2 billion yuan, went up by 13.7 percent, down by 0.2 percentage points; that of tertiary industry was 16,972.7 billion yuan, went up by 18.2 percent, went down by 1.0 percentage point. In secondary industry, the investment in industry reached 12,615.0 billion yuan, increased 13.5 percent year-on-year, down by 0.4 percentage points over the first seven months. Of which, the investment in mining industry stood at 866.0 billion yuan, went up by 3.9 percent, up by 0.1 percentage point; that of manufacture, 10,402.6 billion yuan, increased 14.1 percent, down by 0.5 percentage points; that of production and supply of electric power, heat power, gas and water, 1,346.4 billion yuan, increased 15.7 percent, up by 0.5 percentage points. In tertiary industry, the investment in infrastructure (excluding electricity) was 4,996.3 billion yuan, increased 23.5 percent year-on-year, down by 1.5 percentage points over that in the first seven months. Of which, the investment in management of water conservancy increased 27.6 percent, down by 3.8 percentage points; that of management of public facilities increased 25.4 percent, down by 1.8 percentage points; that of transport via road increased 20.2 percent, down by 0.8 percentage points; that of transport via railway increased 20.6 percent, up by 1.0 percentage point. In term of different areas, the investment in eastern region amounted to 14,167.9 billion yuan, rose by 15.3 percent year-on-year, dropped 0.6 percentage points over that in the first seven months; that of central region, 8,549.3 billion yuan, surged 18.4 percent, down by 0.5 percentage points; that of western region, 7,651.8 billion yuan, increased 18.1 percent, decreased 0.4 percentage point. In term of types of registration, the investment by domestic enterprises was 29,028.9 billion yuan, up by 17.3 percent year-on-year, dropped 0.6 percentage points over that in the first seven months; investment by funds from Hong Kong, Macao and Taiwan was 734.9 billion yuan, up by 6.7 percent, increased 0.5 percentage points; and the investment by foreign funds was 694.0 billion yuan, down by 0.8 percent, and the pace of decline expanded 0.4 percentage points. In terms of jurisdiction of project management, the central investment reached 1,405.4 billion yuan, increased 11.3 percent year-on-year, 0.5 percentage points higher over that in the first seven months; while the local investment was 29.173.2 billion yuan, up by 16.7 percent, declined 0.6 percentage points. Analysis on projects under construction or started this year showed that, the total planned investment in projects under construction reached 80,893.6 billion yuan, up by 12.4 percent year-on-year, decreased 0.7 percentage points over that in the first seven months. The total planned investment in newly started projects was 26,522.5 billion yuan, up by 14.9 percent year-on-year, increased 0.3 percentage points. In terms of paid-in funds, from January to August, 34,008.1 billion yuan had been invested, rose by 12.8 percent year-on-year, 0.1 percentage point lower over that in the first seven months. Of this total, the growth of government budgetary funds went up by 12.2 percent, increased 1.0 percentage point over that in the first seven months, investment from domestic loans went up by 12.6 percent, 0.1 percentage point decreased, that from self-raising funds went up by 16.6 percent, kept at the same level over the first seven months, that from foreign investment decreased 10.1 percent, and the pace of decline increased 0.4 percentage points, other investment dropped 2.7 percent, and the pace of decline increased 0.6 percentage points. 1.The growth rate in this table are all nominal growth rate. 2.For parts of data, the total is not equal to the total of sub-items due to round-off. Investment in fixed assets (excluding rural households): refers to the total workload on construction and purchase for fixed assets during a certain period in the form of currency, as well as the concerning expenses. Paid-in fund: refers to all funds received by investment units used for fixed assets during the reference period, including state budgetary fund, domestic loans, foreign investment, self-raised funds, and others. Newly started project: refers to all newly started construction projects during the reference period. State-owned and Stat-holding Enterprises: including absolutely state-holding enterprises, relatively state-holding enterprises and consultatively state-holding enterprises. Absolutely state-holding enterprises refer to those enterprises that the proportion of state investment capital to the total actual capital (or capital stock) is larger than 50 percent. Relatively state-holding enterprises refer to those enterprises that the proportion of state investment capital to the total actual capital (or capital stock) is less than 50 percent, but larger than any other single share holders. Consultatively state-holding enterprises refer to those enterprises that the proportion of state investment capital to the total actual capital (or capital stock) is less than other share holders, but owning the real control power regulated by agreement. The enterprises which the proportion of investment capital of the two investors is 50 percent, and the share holding control power is not clearly stated by either side, if one of them is state-owned, are all classified as the state-holding enterprises without exception. The investment projects invested by the administrative and institutional units are all classified as state-holding. Types of Registration: the types of registration on the enterprises are based on the Provisions for the Classification of Types of Enterprise Registration jointly issued by NBS and State Administration of Industry and Commerce. And that on the individual operation is based on Note on the Code & Classification of Types of Individual Operation Registration. According to the provision of statistical reporting system, all grassroots units shall fill in registration types. The registration types shall be filled in by the enterprises or individual operation units engaged in investment in fixed assets. Those who have already registered in the industrial and commercial administrative units, shall fill in based on the registration types, if unregistered, shall be filled in based on the registration types of investors or that on the provisions of related papers. Domestic enterprise includes state-owned enterprise, collective enterprise, joint enterprise, limited liability enterprise, share-holding enterprise, private enterprise and others. Enterprises with funds from Hong Kong, Macao and Taiwan includes joint-venture and cooperation by Hong Kong, Macao and Taiwan, Hong Kong, Macao and Taiwan Sole Investment, Hong Kong, Macao and Taiwan Funded Share-holding Corporations Ltd., and other investment enterprises by Hong Kong, Macao and Taiwan. Foreign investment enterprise includes joint-venture and cooperation enterprises, foreign funded enterprise, foreign funded share-holding corporations Ltd., and other foreign investment enterprises. Refers to construction projects on fixed assets and real estates involving a total planned investment of 5 million yuan and over. The report of investment on fixed assets is collected monthly with complete enumeration (no report in January). Eastern region: including Beijing, Tianjin, Hebei, Shanghai, Jiangsu, Zhejiang, Fujian, Shandong, Guangdong and Hainan. Central region: including Shanxi, Anhui, Jiangxi, Henan, Hubei and Hunan. Western region: including Inner Mongolia, Guangxi, Chongqing, Sichuan, Guizhou, Yunnan, Tibet, Shaanxi, Gansu, Qinghai, Ningxia and Xinjiang. 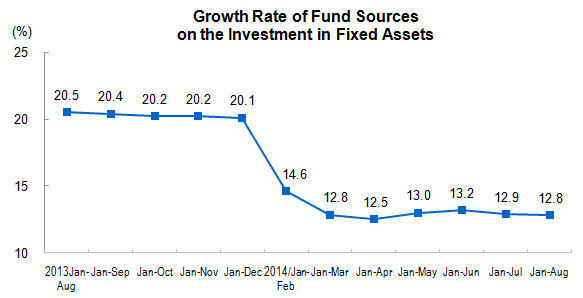 The growth rate of investment in fixed assets are calculated in nominal except that in Jan.- Mar., Jan.-Jun., Jan-Sep. and Jan.-Dec. in case of the price indices of investment in fixed assets are calculated on quarterly.